4GREER A2 Microcomputer will automatically test the battery and select the correct charging method. 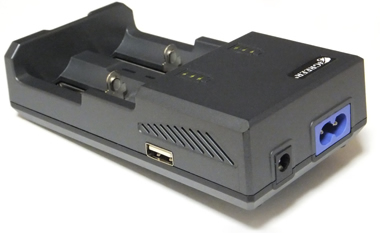 4GREER A2 is also a Power Bank to recharge a smart phone, tablet, and more using an optional USB cable. The powerful 4GREER HI AX Series flashlight is a unique crossover combining the best of our Tactical, Sports, and Every Day Carry products into one. 4GREER HIC flashlight with an extremely focused light beam combining the best of our Tactical, Sports, and Every Day Carry products into one. Long Distance throw to 500m, high powered output at 2000 lumen, hidden strobe excellent for crowd control. 4GREER MS1, Mount System 1, is made robust with one of the strongest engineered plastics, PEEK CA30, as per military specification: MIL-P-46183 Type III, Class 2. 4GREER RangeMaster C is a Programmable Long Distance Throw Tactical Flashlight designed for narrow long distance throw over 800 metres, while remaining light weight and excellent for close range and tactical use. 4GREER RangeMaster Programmable Long Distance Throw Tactical Flashlight designed for narrow long distance throw over 800 metres, while remaining light weight and excellent for close range and tactical use. 4GREER RM Series Filter light weight and easy to use. Easy to use Remote Switch waterproof to 1m for all 4GREER RM Series Flashlights.